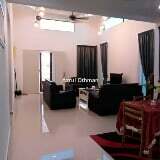 New 1.5 Single Storey Bungalow located at Taman Belimbing Setia Durian Tunggal Melaka for sale RM520. NEW Bungalow For Sale Taman Nuri, Durian Tunggal Melaka Freehold, Non Bumi 5,843sqft Gat. Land size 50x80 direct owner selling price rm750000 can negotiable for serious buyer.